The Kaman SH-2G Super Seasprite is an American ship-based helicopter with anti-submarine, anti-surface threat capability, including over-the-horizon targeting. This aircraft extends and increases shipboard sensor and weapon capabilities against several types of enemy threats, including submarines of all types, surface ships, and patrol craft that may be armed with anti-ship missiles. It was originally developed for the United States Navy in 1980s as a reengined version of the older Kaman SH-2 Seasprite. In 1985, the SH-2G program was started. The US Navy wanted better anti-submarine capabilities and felt upgrading current helicopters would be a more cost-effective approach; moreover legacy Knox-class and early "short-hull" Perry-class frigates operating the SH-2F could not operate the larger SH-60B Seahawk. The prototype YSH-2G first flew on 2 April 1985. The prototype was a modified SH-2F fitted with two more powerful General Electric T700-GE-401/401C engines. The G-model has a reinforced upper fuselage to support the new, heavier engines. The SH-2G also has multifunctional displays and new avionic systems. The Navy began receiving Airborne Mine Counter Measures (AMCM) hardware with the Kaman Magic Lantern laser mine detection system in December 1996. The US Navy's final production order of the SH-2F was in Fiscal Year 1986 with the last six orders switched to the SH-2G variant. In the 1990s, the Royal Australian Navy (RAN) decided it needed an intermediate helicopter to operate from the Anzac-class frigates and the planned offshore patrol vessel (OPV); a proposed cooperative project with Malaysia, however, due to its size, the OPV could only operate a small helicopter. 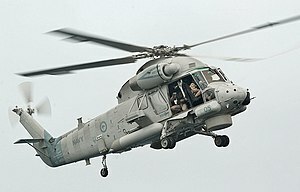 In 1997, the Australian Government signed a A$667 million contract with Kaman to purchase 11 upgraded Super Seasprites. By 2005, up to 40 deficiencies in the helicopter had been identified, including the inability to operate in bad weather and low-light conditions, and its failure to meet Australian airworthiness standards. The helicopters were initially restricted to transport duties during good weather before being grounded in May 2006. By early 2007, ten Super Seasprites had been delivered to 805 Squadron. In February 2007, The Australian announced that the Seasprite project was "almost certain to be scrapped". At this point, the project was six years over schedule and its cost had grown to A$1.1 billion, with an additional A$45 million forecast as required for further upgrades. If approved the squadron still not reach operational status until 2010. The sale or scrapping of the fleet was under consideration, possible replacements included the NHIndustries NH90 or further orders of Sikorsky SH-60 Seahawks. On 25 May 2007, The Age reported the government would continue to support the Seasprite; Defence Minister Brendan Nelson commented that progress on the project was being closely monitored. Following the election of the new Labor government, The Australian reported on 31 January 2008 that the SH-2G(A) program was likely to be canceled due to cost overruns; additionally it was still not operational despite the original contract being signed in 1997. The same article also noted that Sikorsky had submitted an offer of several 'off the shelf' helicopters to replace Australia's SH-2G(A)s. On 5 March 2008, the project was canceled by the government; Kaman noted the project's end "on mutually agreed terms". Opposition parties also supported the decision to cancel. The remaining aircraft were returned to Kaman. Following the cancellation of the Super Seasprite, S-70 Seahawks from 816 Squadron were assigned to the Anzac-class frigates. In 1995, Egypt signed a contract for 10 SH-2Gs for use by the Egyptian Navy. These helicopters had been equipped for anti-submarine duties and to be deployed on the Navy's ships as required; the procurement included AQS-18A dipping sonar, search radars, and an electronic support suite. They are often operated alongside Egypt's fleet of Westland Sea Kings. The Royal New Zealand Navy (RNZN) replaced its Westland Wasps with two interim SH-2F Seasprites (ex-US Navy), to operate with Anzac-class frigates until the fleet of five new SH-2G Super Seasprites were delivered. The Navy air element was transferred to No. 6 Squadron RNZAF at RNZAF Base Auckland in Whenuapai in October 2005. RNZN Seasprites have seen service in East Timor. New Zealand purchased five SH-2Gs at the same time as Australia. However, New Zealand opted for new-build airframes that were outfitted with different avionics. The SH-2G purchase was completed at NZ$12 million under the $338 million budgeted (excluding GST). The first RNZN SH-2G was delivered in mid-2001, and the last was delivered February 2003. The Royal New Zealand Navy (RNZN) operates the type from its two Anzac-class frigates, two Protector-class offshore patrol vessels, and the multi-role vessel HMNZS Canterbury. They were initially operated by the Naval Support Flight of No. 3 Squadron RNZAF, but now from No. 6 Squadron RNZAF. In May 2012, Defence Minister Jonathan Coleman announced that Cabinet had given Defence officials approval to negotiate with Kaman Corporation for the 11 helicopters and flight simulator from the canceled Australian SH-2G Super Seasprite project. It is thought the 11 helicopters, worth NZ$1.4 billion in 2008, would cost New Zealand between NZ$130 million to NZ$230 million. A decision to purchase ten of the helicopters for $NZ242 million was announced on 19 April 2013. Eight of the aircraft will enter service with the RNZAF to replace the existing five Seasprites, and the remaining two will be used as a source of spare parts. The New Zealand Ministry of Defence accepted the first of the helicopters in the United States on 1 December 2014, and two more will be delivered to Auckland in early 2015. It is expected that deliveries will be completed by the end of 2015. All the aircraft are scheduled to be in service by 2016. The NZDF's five SH-2G(NZ) Seasprites were officially retired on 14 April 2016, and will conduct their last flight on 21 April after serving since August 2001. They will be replaced with eight newer SH-2G(I) models, allowing the Navy to embark up to three helicopters from ships at once instead of two. The "I" model also replaces the AGM-65 Maverick with the AGM-119 Penguin anti-ship missile. New Zealand's first five SH-2Gs were sold to the Peruvian Navy in October 2014. Four of the ex-New Zealand SH-2Gs will be remanufactured and upgraded by Kaman before they are introduced to service with the Peruvian Navy. The "implementation phase" of Peru's Seasprite purchase is expected to conclude in 2018. The helicopters will be operated from the Navy's Lupo-class frigates. Beginning in 1991, the US Navy received 24 SH-2Gs, which were assigned to US Navy Reserve units. The Super Seasprite entered service with HSL-84 in 1993. The SH-2 served in some 600 Navy deployments and flew 1.5 million flight hours. The Navy Reserve retired the last of the helicopter by June 2001. Anti-submarine warfare helicopter, powered by two 1,723-shp (1,285-kW) General Electric T700-GE-401 turboshaft engines. Export version for Australia, upgraded former US Navy SH-2F. Export version for Egypt, upgraded former US Navy SH-2F. Proposed export version for Malaysia. Export version for New Zealand. Sold to Peru. Redesignated SH-2G(A) sold to New Zealand. 162576 – SH-2G on static display at the Wings of Freedom Aviation Museum in Willow Grove, Pennsylvania. ^ a b c Eden 2004, p. 219. ^ a b Frawley 2002, p. 100. ^ a b c Jane's Aircraft Upgrades. Jane's Information Group, 2009. (subscription article) posted 20 March 2009. ^ a b c d e f Walters, Patrick (2007-02-10). "Seasprite headed for the junk pile". The Australian. News Corporation. pp. 1–2. Retrieved 2007-02-11. ^ a b c d Allard, Tom (2005-03-19). "Navy's $100m chopper can't fly in bad light". The Sydney Morning Herald (SMH.com.au). John Fairfax Holdings. Retrieved 2007-02-11. ^ a b "Technical problems ground Navy helicopters". ABC News Online. 2006-05-19. Retrieved 2007-02-11. ^ "Seasprite Helicopters" (Press release). Minister for Defence. 25 May 2007. Retrieved 2007-11-05. ^ Dodd, Mark (31 January 2008). "Troubled anti-sub choppers face axe". The Australian. News Corporation. Retrieved 2008-02-04. ^ "Seasprite Helicopters to be Cancelled" (Press release). Department of Defence. 5 March 2008. Archived from the original on March 11, 2008. Retrieved 2008-03-05. ^ "Australia Government Seeks Discussion With Kaman to Conclude SH-2G(A) Super Seasprite Helicopter Program" (Press release). Kaman Corp. 5 March 2008. ^ "Australia Scraps Super Seasprite Program". Rotor & Wing, 5 March 2008. ^ "Seasprite cancellation" (Press release). Liberal Party of Australia. 2008-03-05. ^ "Kaman Takes SH-2G to Eastern Europe". Rotor & Wing, 4 September 2008. ^ Cordesman 2006, p. 184. ^ Stuart, Ian (14 May 2012). "Reject Aussie choppers on Navy shopping list". The New Zealand Herald. ^ "NZ to buy navy helicopters rejected by Australia". Radio New Zealand News. 19 April 2013. Retrieved 20 April 2013. ^ "New Zealand approves purchase of Kaman Super Seasprites" Vertical Magazine, 19 April 2013. Accessed: 11 December 2013. ^ a b "Seasprite helicopter project approved". Media release. beehive.govt.nz. Retrieved 20 April 2013. ^ Rahmat, Ridzwan (3 December 2014). "New Zealand accepts first SH-2G(I) Super Seasprite helicopter". IHS Jane's 360. Retrieved 16 January 2015. ^ a b Tantalean, Cesar Cruz (9 October 2014). "Peru signs for SH-2G Super Seasprites". IHS Jane's 360. Retrieved 12 October 2014. ^ "Kaman Awarded $39.8M Contract to Commence Implementation Phase of Peru SH-2G Super Seasprite Program". Press release. Kaman. 12 July 2016. Retrieved 2 December 2016. ^ "Peruvian Navy Acquiring All Five RNZAF SH-2G(NZ) Seasprites". Air Forces Monthly. 14 October 2014. Retrieved 2 December 2016. ^ Stephens, Ernie. "Putting the "Super" in the Kaman Super Seasprite". Rotor & Wing, 1 October 2009. ^ "Kaman Helicopters to Showcase SH-2G(I) Super Seasprite at Black Sea Defense & Aerospace Exposition". Kaman Aerospace, September 3, 2008. ^ a b c "World Air Forces 2018". Flightglobal Insight. 2018. Retrieved 25 August 2018. ^ "US Navy SH-2 Seasprite". globalsecurity.org. Retrieved 26 January 2013. ^ "KAMAN SH-2G "SEA SPRITE"". Harold F. Pitcairn Wings of Freedom Aviation Museum. Wings of Freedom Aviation Museum. Retrieved 4 June 2017. Eden, Paul. "Kaman SH-2 Seasprite", Encyclopedia of Modern Military Aircraft. Amber Books, 2004. ISBN 1-904687-84-9. Frawley, Gerard The International Directiory of Military Aircraft, Aerospace Publications Pty Ltd, 2002. ISBN 1-875671-55-2. Wikimedia Commons has media related to Kaman SH-2G Super Seasprite.